Herons "represents the starting point of the journey of the Aztecs ended the shores of Lake Texcoco. In the left and right flanks two haughty herons representing the land of Aztlán guarded a jaguar appear. Tecuala before the conquest belonged to the kingdom of Aztlán, Chimalhuacán Federation. In 1530, the Spanish expedition arrived Nuno Beltran de Guzman, who in their company of conquest had to face the natives of the region who after being defeated by it chose to provide parties to the victors. The Lord Cornica offered an exciting show which consisted of a death struggle between an alligator and a jaguar. During his stay in the country, heavy rains and floods during which many Spaniards died were recorded; the large number of deaths led to epidemics that decimated further conquerors and natural. In 1531, Nuno Beltran de Guzman reorganized his army weakened and continued the conquest to the state of Sinaloa. In 1754, the Real Audiencia of New Galicia gave the people of Olita, Tecuala today, the ground for his legal fund. By 1904, during the government of General Mariano Ruiz, he became a Tecuala in Subprefecture and from 1918 was considered municipality of Free and Sovereign State of Nayarit. In the same year that the provision of land to the peasants decreed San Felipe Aztatán, which became one of the first suburbs in the state. It stresses in the city Temple of the Sacred Heart of Jesus, built in the middle of this century. In the suburbs of San Cayetano is the center of the estate of the same name dating from the eighteenth century. In San Felipe Aztatán is the monument erected to the Mexican culture as it is considered locally as the original home of the Mexica or Aztecs. Jose Lopez Portillo y Weber said that in that place formerly Aztatlán, the pilgrimage that culminated in the founding of Mexico-Tenochtitlan began. Its main festival is the sábadode Gloria, which is celebrated with fireworks and burning of Judas. Another important feast day is December 12th when celebrating the Virgin of Guadalupe where, previously, from 4 to 12 December, processions, dances, fireworks, sporting events and popular dances are performed. Band music is mainly heard in the town and to a lesser extent and mariachi trios. Nets and fishing gear, backpacks, bags, saddlery and blacksmith work are made. Shrimp is plentiful dry (dehydrated), with which made known barcinas, a food preservation method that allows to deal with shortages. Dried shrimp wrapped in spherical shape, covered with palm leaf that absorbs moisture from the environment and the end is covered with a network of artistically woven lanyard, it constitutes a true craftsmanship. 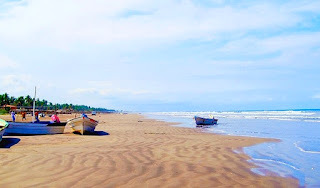 Novillero beach, popular and frequently visited is listed in the Guinness World Records for its 82 kilometers long and 50 meters wide, in her practice of water sports is possible. The Acaponeta River flows at this point and near Agua Brava lagoon, large fishing area and shrimp farming is. In San Felipe Aztatán is the aforementioned monument to "The Mexicanidad".